Yosemite! The unique location of this conference at the Tenaya Lodge adjacent to Yosemite was a treat for all of us. You can't beat scenery like this, which we could all enjoy during breaks from sessions and activities. Databases! : State Librarian Greg Lucas shared about the plans to, at long last, provide California schools with statewide databases. California is the only state in the nation that has not had a budget to provide database subscriptions for our schools. An advisory committee is now working on selecting databases from the new budget allocation. Hooray! The UnConference. So, yes, I'm biased, since I've been organizing this event for CSLA each year since 2015, when I "cloned" AASL's 2014 inaugural UnConference initiated and led by Joyce Valenza. Still, I do believe that this year was our very best we've had in terms of participation, ideas shared, engagement, and enjoyment. We had an enthusiastic group in the room participating in breakout discussions, Smackdown sharing, and, a fun Team Trivia Contest to end the evening. 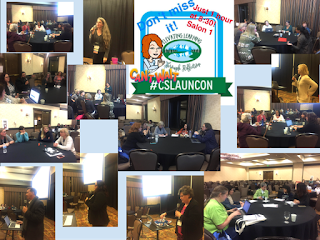 And, those #NOTatCSLA could and still can benefit from the activities, since we took notes on the breakout sessions, have the Smackdown slideshow online, and live streamed and recorded the Smackdown. You can also follow some of the evening by searching for the #CSLAUnCon hashtag on Twitter. All these resources, plus those from past UnConferences, are also curated at bit.ly/cslauncon. I also live streamed the two sessions I presented, so you can view both the slides and the recordings. On Thursday, I presented a workshop on "Social Media: A Must Have for You AND Your Library… and How to Get Started or Up Your Game." You can view the slides at bit.ly/csla18sm. You can also access the activity and action plan worksheet participants completed during the second hour, and hear take aways some of the participants recorded with Flipgrid at the end. And one final small victory for me during this conference: with a lot of help from my friends (shout out to my daughter Elaine, Nancy Jo Lambert, Katie McNamara, Jasmine Riel, Tara Martin, and Cynthia Melara) I finally learned some of the ins and outs of using Snapchat! 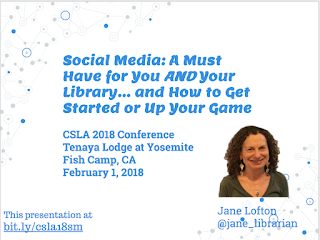 CSLA will post presenter slides and handouts on the #CSLA18 conference webpage soon. Many thanks to CSLA's Conference Committee, Board, and organizer staff Janice Gilmore-See, Kathie Maier, and Mark Williams for an enriching conference. And, mark your calendars for February 7-10, 2019 in the City of Industry. Let's Chat -- Who, What, When, Why and How?